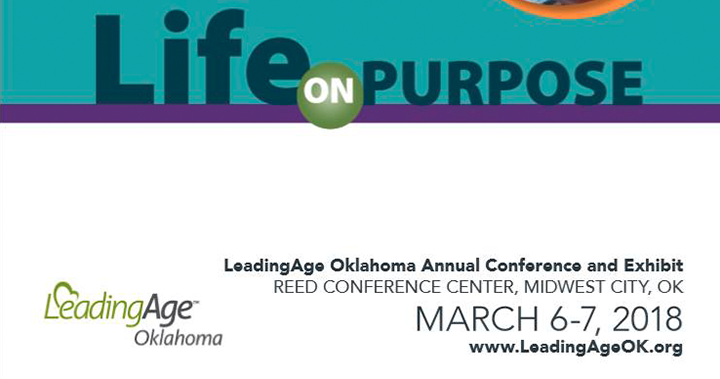 LeadingAge Oklahoma’s two-day Annual Conference starts tomorrow, March 6 in Midwest City, OK at the Reed Conference Center. This year’s theme, “Life on Purpose,” aims to detail the true purpose of anyone’s life (to be fully involved in living) while describing how our industry can assist older adults in achieving this purpose. LTC Administration ­– Leah Killian-Smith will present, “The New Survey Process – Preparing Your Team for Success,” on March 6 from 3:15 p.m. – 4:45 p.m. Nursing – Leah Killian-Smith will present, “Requirements of Participation Compliance for Nursing” and “Competencies, Skills and Person-Centered Care Planning,” on March 7 from 8:30 a.m. – 10 a.m.
March 6: 10 a.m. – 3:30 p.m.
March 7: 10 a.m. – 1:30 p.m.
We can’t wait to connect with you and discuss ways to assist others in living a life on purpose.